There are two versions of the Controller Software at present. Version 2.4.x (Stable) and 3.1.x (Beta). You should always check the latest changelogs for features and fixes included with each version. Always install the latest Stable release unless you require a specific feature or improvement which is only found in the Beta release. UAP-AC users should be using the latest Beta firmware (currently 3.1.13-RC) for best performance, features and improvements. 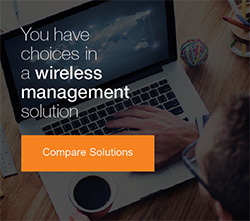 Did you know that you can lose up to 1/3 of overall throughput when adding a wireless uplink access point. This is because the Access Point has to receive the information from the client and then retransmit it on to the uplink access point. Putting in a dedicated point to point bridge between the two devices can resolve this. Wireless Uplink (Wireless Repeaters) should be used as a last resort only or where performance is not an issue. The typical characteristics of radio frequency are the lower the frequency = slower speeds, better penetration through objects (Near/Non Line of Sight) whilst the higher the frequency = fasters speeds, largely affected by objects (Line of Sight). This means that although 802.11ac provides much better speeds than 802.11b/g/n it does not work as well through objects and quite often the signal will dissipate more rapidly that by the time the client receives the connection the connection speed is the same if not worse than on the 2.4GHz frequency. 5GHz – 802.11a/n/ac should ideally be used for open line of sight scenarios such as offices, stadiums, schools and conference rooms where the client can see the Access Point and or has to traverse one or two walls max. It is recommended that you always leave the UniFi Access Points on Auto for Channel Selection and TX Power. You should only manually set Channel Selection and TX Power if you are having issues believe it will resolve them for you. One scenario might be a high density deployment where all AP’s must be running a very low TX Power and the channels must be statically set to best prevent overlapping.